This year I celebrated my first Thanksgiving away from home, but more importantly, away from Mom’s cooking. However, I did not have a complete breakdown and resort to binge eating of Spanish tortilla, jamón serrano, and cold gazpacho soup for supper. Instead, two American girls, a girl from England, and I—all fellow language assistants in Spain—got together Thursday afternoon and prepared something close enough to a traditional American Thanksgiving feast. What was on the menu? If you’re not hungry yet, you will be after reading this list: roast whole chicken with onions, herbs, and olive oil…homemade gravy made from chicken drippings…buttery mashed potatoes…green beans cooked with bacon…pumpkin (butternut squash) pie made completely from scratch…sweet potato casserole with brown sugar & pecan topping…cranberry sauce (substitute) made from pomegranate seeds. How did we do it? 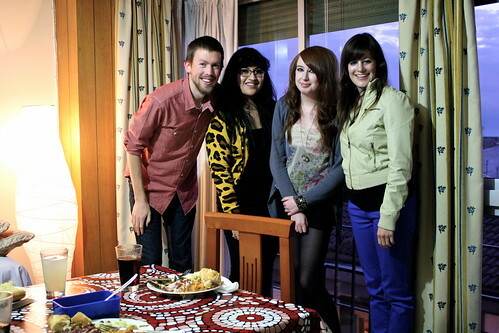 With an oven, stovetop, and a few pots, pans, and dishes, you, too, can enjoy an expat Thanksgiving next year! Below are links to the recipes I used as well as my mom’s sweet potato casserole recipe and some directions on how to make pomegranate “cranberry” sauce. Since we failed to order a turkey from our local butcher’s shop (carnicería) a week or two in advance, we had to settle for a whole chicken from the grocery store. But it was a worthy substitute. None of us had ever roasted a whole chicken before, but we followed this recipe from the website Beyond Kimchee and pulled out a beautiful, savory bird from the oven after one hour. I made this on a whim after we took the chicken out of the oven. Starting from Pioneer Woman’s gravy recipe, I took 2 tablespoons of the drippings (mmm!) and added to that 2 tablespoons of flour in a small frying pan on medium heat. Stirring constantly, I added some splashes of milk from the carton as needed until it looked creamy. It was so very tasty. This recipe is probably impossible to mess up. My friends brought a bag of gold potatoes (patatas para cocer) and they ended up using around ten of them. After peeling them, they boiled them for 15-20 minutes until tender, then mashed them with a stick of butter, milk, salt and pepper. This dish was really easy to make, too. I threw in two cans of green beans (alubias verdes finas) and laid two strips of bacon over the top. Then I brought the whole thing to a boil for a few minutes before turning the heat down the low and simmering it until dinner was ready. Since Spain has neither Libby’s canned pumpkin nor Pillsbury frozen pie crust, I found myself at a crisis this Thanksgiving. But, thankfully, people have been making pies from scratch for hundreds of years, so summiting the pie-making mountain wasn’t an impossible feat. For the crust, I followed this recipe from Smitten Kitchen. It turned out okay, but would have been much better had I had a pastry cutter to cut the cold butter into the flour. For the pumpkin filling, I picked up two butternut squashes and cooked them in the oven according to the first part of Pioneer Woman’s recipe. Why squash, you ask? Well, for one, orange Halloween pumpkins are disgusting—flavorless, stringy, and pale. (I would know; I tried to cook one a month or two ago and it was awful.) Also, the variety of pumpkin used in Libby’s canned pumpkin—the Dickinson pumpkin—belongs to the same species as butternut squash. They taste basically the same. 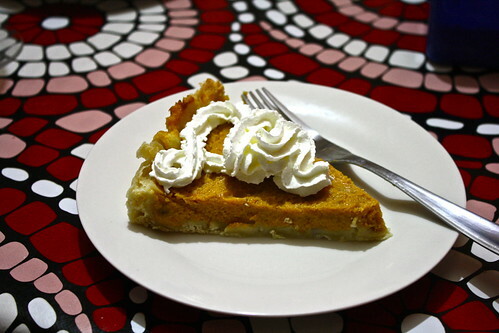 Then, to make the pie itself, I used this Better than Pumpkin Pie recipe from Allrecipes.com. I used 3/4 cup of sugar instead of a whole cup and I didn’t have any cornstarch or allspice on hand, but in the end, it tasted just like Mom’s. If I were to bake it again, I would add more cinnamon, cloves, and nutmeg to give it more of that pumpkin pie spice flavor. This is probably my favorite dish at Thanksgiving. The earthy creaminess that the sweet potatoes give pairs like a dessert with the sugary/nutty topping. This recipe comes from my mother. Peel and boil the sweet potatoes for 15 minutes, then mash them into a purée. Mix the mashed sweet potatoes, butter, vanilla extract, eggs, milk, and sugar together and pour into a greased baking dish. Mix the brown sugar, flour, pecans, and melted butter and drizzle over the sweet potato mixture. Bake covered with foil 30 minutes at 350 F (170 C). Cranberry sauce + turkey meat = a completely new flavor altogether. Sadly, fresh cranberries just aren’t sold in Spain (although you may be lucky and find raisin-lookalike dried cranberries). An equivalent substitute involves pomegranates, which every grocery store should carry. If you want it to taste a little “festive,” make sure to add the cinnamon and cloves. This recipe is a little something I whipped up on my own after watching this video blog from the New York Times. Slice the pomegranates and remove the seeds into a small pot. Add the orange juice, sugar, and spices and bring to a boil for 15 minutes, stirring. Refrigerate for 2 hours until chilled and no longer runny. 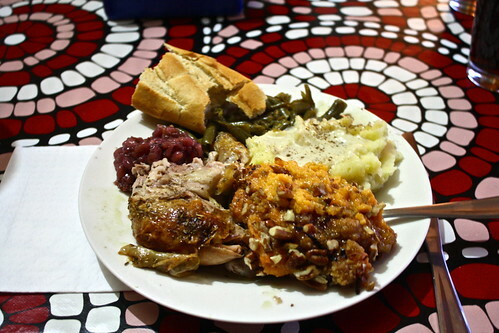 If you’re living abroad (or have in the past), how have you prepared a Thanksgiving feast? Has it been harder or easier depending on the location (Europe vs. China, for example)? Discuss it below!